Please note a list of all the articles in this series so far, appear at the foot of the page. April 1920 was a most curious month for Arsenal, for as quite often happened at this time, fixtures were packed in around the movable feast that is Easter, and as well as the regular Saturday games there were always one or two extra matches which made use of the lighter evenings to fit in a mid-week match later in the month, plus games on the public holidays of Good Friday and Easter Monday. In fact Arsenal had no fewer than seven league games scheduled for the month of April 1920, and yet in addition to that, two friendlies were also arranged. Indeed rather oddly the first away friendly with Bolton was on Good Friday, 2 April, when Arsenal did not have a game scheduled. But Arsenal did have games on the next day (3rd), Easter Monday (5th) and on the Tuesday (6th). Yet they still wanted one more! However there was a reason. Although the friendly game on 2 April resulted in a defeat to Bolton, in front of a surprisingly good crowd of 14,700. Arsenal used the match to give a game to Williamson (who had been first choice keeper but had now lost his place to Dunn). Also Cownley got a game at right back; he was the player who had initially been the replacement for Joe Shaw when he was injured. Shaw himself on this occasion played left back – an experiment undoubtedly, while in midfield the club used Tom Whittaker for the first time, who had joined straight from the army in October. This is, of course, the same man who went on to become the trainer and physio under Herbert Chapman, and our post Second World War manager who won the league twice and the FA Cup once. 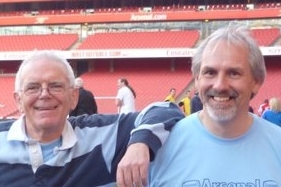 (There is more about Tom Whittaker’s work at Arsenal in this article). At centre half we had Butler who had been playing right half, and would go on to play centre half in future games. At left half there was Baker who had started the season at outside left and was being tried out in his new position of left half. Outside right was Greenaway who had yet to play this season but was going to get a few games before the month ended, and we had White at inside right – another new name to the squad. Plus there was Pagnam who was coming back from injury, Hardinge who had lost his place at inside left but scored our two goals on this occasion and Toner who had also lost his place after a solid run at outside left. So there was purpose, in addition to an attempt to draw in the crowds one more time for some extra money that was presumably shared between the clubs. Bolton were 8th in the league at the time of the match and with Arsenal’s mix-and-match line up a 2-4 defeat away from home was not considered too disastrous. But why Bolton? Well, Bolton might have been chosen as a venue for this match as the game the following day was at Burnley, and the two grounds were only about 25 miles apart – an easy train journey from one ground to the next. At least one presumes the team did not travel all the way back to London only to set off the next morning all over again! The league table ahead of Arsenal’s match with Bolton on 3 April showed Burnley up to 2nd and Arsenal languishing in 14th. The title favourites were very clearly WBA, four points clear of Burnley with three games in hand. Arsenal likewise had a game or two in hand over clubs above them, but obviously needed to win to make something of this. However Burnley had only lost three at home all season and it seemed unlikely. Here’s the table before the game. It certainly looked tough for Arsenal, and so it turned out to be as on 3 April Burnley won 2-1 with Pagnam playing centre forward getting the goal. Shaw turned out again for the second day running, this time playing at right back. The players now at least had Easter Sunday off before playing again on 5 April at Highbury, this time against the runaway leaders WBA who were 17 points ahead of Arsenal – with Arsenal having slipped down to 15th. And here we need to take a look at the bottom of the table. Arsenal were now just four points away from Derby County who occupied the upper of the two relegation positions. What helped Arsenal was that they had two games in hand and there were of course five other teams between them and Derby. But Easter was a time of collapses and sudden positive runs and Arsenal most certainly could not rely on another team to slip up. Arsenal had won three out of the last nine and were now playing the runaway leaders and… surprising all commentators of the day, Arsenal won 1-0. Very unusually Arsenal kept the same team as had played the day before. Blyth got the goal in front of 40,000. According to the press report, at one stage a fire in a neighbouring chimney resulted in the whole ground being enveloped in thick smoke but the players battled on. This was after all the post-war period and people were used to battling on. Arsenal were back up to 14th. But still there was no rest as on 6 April Arsenal now travelled to the West Midlands for the return game and this time lost 1-0, again in front of 40,000 as Tom Whittaker came in for his first league match. But once again Shaw had to drop out. Clearly his injury was continuing to trouble him. However other results went in Arsenal’s favour and they stayed in 14th. Now there was four days rest before the next game on 10 April: the return match with Burnley – the return of the game that was lost in Lancashire 1-2 on 3 April. And this time, just one week later on 10 April, Arsenal used their home dominance to get a much welcomed win 2-0. Only 20,000 turned up to Highbury to see Bradshaw and Pagnam get the goals, but Arsenal were up to 12th and had seven points and nine teams separating them from Blackburn in 21st. However this match had an extra significance, for because of Arsenal’s defeat of Burnley, West Bromwich Albion were now eight points ahead with Burnley having only three games left to play. As a result WBA won the Football League title for the first (and up to 2018, the only) time. Next up was the second friendly of the month, a game away to Clapton Orient on 12 April. Sadly, only one detail remains for this game – other than the disappointing score of a 5-1 defeat. Tom Whittaker now scored his first goal for Arsenal. One presumes that it was very much a second XI team playing against the O’s first XI. There were now four games left in the season, two against Preston and two against Bradford (often referred to these days as Bradford Park Avenue or Bradford PA, to distinguish them from Bradford City, who as we have seen were also in the first division at this time). Before the game Preston were 18th in the league, just one point above Blackburn, and so they now had far greater anxieties about relegation than Arsenal. Yet despite the importance for them of this game a below average crowd of 13,000 saw a 1-1 draw which left Arsenal in 13th and Preston in 18th. White, the original number 9 at the start of the season returned at insight right and got the goal. Meanwhile we have little information on the activities of Sir Henry Norris at this time, which almost certainly means that he was able to be at all the Arsenal games. One thing we do know however, thanks to the research of Sally Davis, was that on 22 April he was present when Prince Albert visited the International Building Trades Exhibition at Olympia. It seems Sir Henry attended the lunch given in the prince’s honour and took part in a discussion about whether raising money for housing schemes through the issuing of housing bonds (a favoured way of raising money at the time) was likely to be a success. Sir Henry, whose knowledge of football was second only to his knowledge of house building, thought not. One week on from the first Preston match, on 24 April the return match at Highbury drew 35,000, and the result (a goalless draw) was helpful in terms of ensuring there were no last minute concerns about the drop. But Preston must have been a lot more anxious for these two draws had meant they had slipped into the relegation position of 21st. Three teams were now all on 35 points, separated only by a goal average of marginally over one hundredth of a goal. It was the sixth time Aston Villa won the Cup since their first win in 1887, and yet after this date they won the trophy just once more, in 1957. Since that date they have appeared in two more finals, the most recent of which at the time of writing was 2015 when they lost by the largest margin of defeat since 1903, losing 4-0 to Arsenal. On 28 April 1920 Arsenal played out a goalless draw away to Bradford in the first of the two games against the club. The result was another goalless draw in front of just 7,000 (just over one third of Bradford’s average home gate for the season) this being Arsenal’s third draw, and second goalless draw in a row. Arsenal moved up to 11th, while at the foot of the table, with just one game to go, any one of five clubs could go down. As we have noted, the champions had already been crowned, and Sheffield Wednesday had been relegated a long time before. But any one of four teams could go down, depending on results on the final day. (Technically Bradford City could also be relegated but since that would have required Blackburn to win by 4-0, while Derby, Notts County, Preston and Blackburn all lost, that seemed unlikely).